The quality of concrete can be assessed from its penetrability, density, elastic properties and modulus of concrete. 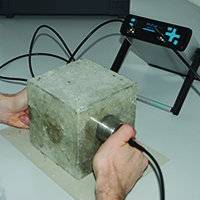 Ultrasonic pulse velocity is able to give information on density and elastic properties of a material which can be further translated into the quality of the material. 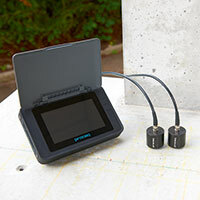 The Pundit PL is our latest meter for measuring Ultrasonic Pulse Velocity and Ultrasonic Pulse Echo. It can be used to estimate density, strength as well as locating defects; cracking, voids, honeycombing and delaminations. The Pundit Lab is our famous meter for measuring Ultrasonic Pulse Velocity. It can be used to estimate density, strength as well as locating defects; cracking, voids, honeycombing and delaminations. It is ideal for the lab. 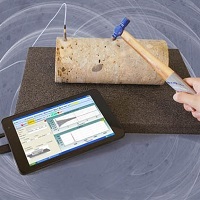 The Resonance Modulus Tester is used to estimate dynamic modulus and Poisson’s ratio for concrete and rock samples. It uses three modes of vibration to do this using an ASTM method. It is completely non-destructive. This simple rugged Ultrasonic Pulse Velocity system makes use of 2 fixed dry point contact transducers. 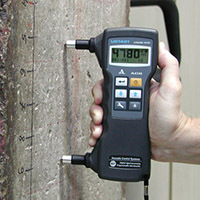 It can be used to estimate density, strength as well as determining crack depths. Permeability of the concrete cover is extremely important for the durability and service life of a structure. The Torrent measures air permeability of concrete non-destructively using a Swiss standard method.